OMG Posters! » Archive "State of the Union" Art Print by Rafa Jenn - OMG Posters! The mysterious Rafa Jenn just dropped this new art print, and he actually gave a little bit of explanation about it. “State of the Union” is a 16″ x 24″ screenprint, has an edition of 50, and costs $49. Visit RafaJenn.com. “I can remember thinking in my years as a student that art and politics make uneasy bedfellows. 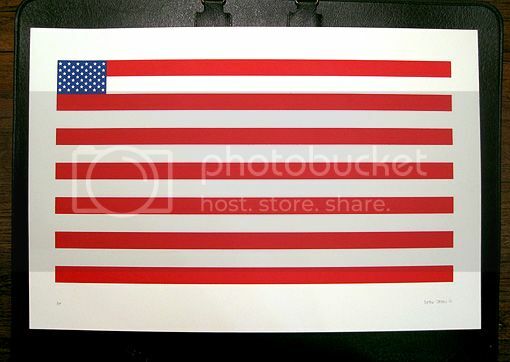 So it is only after thoughtful consideration that I present my latest print: “Sate of the Union”. I realize that images will speak for themselves and will often find juxtaposition in a variety of contexts. In spite of that, and also because of it, I should briefly like to assert that for me this image corresponds with a felt sense of disproportion, of the distribution of wealth especially, of grievances against biased systems, and a yearning for a restoration of balance. Rafa puts out quality stuff. I like it. My take on this is, as ryan stated, that the stars are indeed the states, but the stripes represent the founding fathers of the country. Or the leaders today being the big wigs or fat cats. Being a bit too big for their own good.